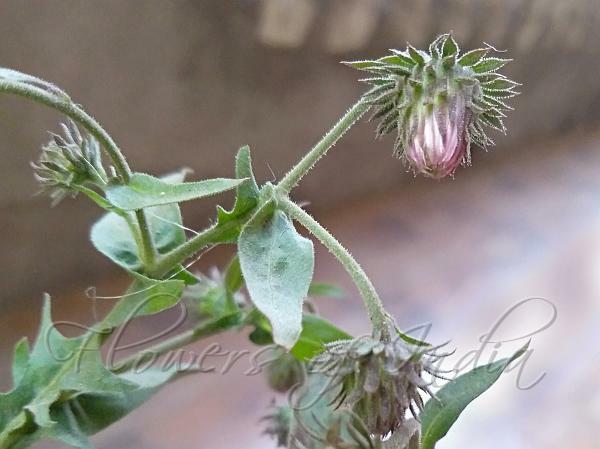 Curly Blumea is a herb with stems much branched, 40-100 cm tall, stems and branches narrowly winged with irregular deeply toothed lobes or interrupted wing. Stem teeth and leaves are densely softly hairy, mainly with short erect glandular hairs. Lower leaves are stalkless or sometimes with winged, deeply toothed stalk up to 1.5 cm, blade narrowly obovate, 5-17 x 1.5-6 cm, base long trrowed, margin nearly entire to toothed, tip pointed. Upper leaves are narrower, slightly tapered below, oblong, sometimes subobtuse. Flower-heads are born at branch ends, pink to purple, 1.0-1.5 cm in diameter, carried on slender stalks. Involucre is about 7 mm in diameter, phyllaries 4.5-9 mm, at least outer ones glandular-hairy. Florets are 6.5-8 mm. Seed-pods are about 1 mm, Pappus 6 mm. Curly Blumea is found in the Himalayas, below 2000 m. Flowering: January-July. Photographed in Imphal, Manipur & Sirmaur Distt, Himachal Pradesh.